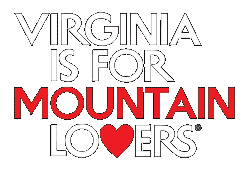 Giles County, VA- Those who live in or visit Giles County usually have one or multiple resounding places or people that they have a connection with and love! For some it may be a scenic overlook, others it may be the mountain biking path through the mountains, even some may have a relaxing cabin that is perfect for them. Many couples have come to Giles to get married and displayed their love for friends and family on their special day! It’s time to share that love of Giles and the special places, people, and events with the world. For the entire month of February you are encouraged to make a heart symbol and take your picture then share online using #LoveGilesCoVA! These pictures can be posted on Twitter, Facebook, or Instagram. You can find Giles County on Facebook.com/GilesCountyVA, Twitter @VisitGilesCo, and Instagram @GilesCoVA. In true February fashion, love is in the air. While you are enjoying your work week, family dinner, next adventure through the mountains, or peaceful moment along the river be sure to snap a picture with a heart and then share it. By using #LoveGilesCoVA you can also follow what others are posting and what they love about Giles! You may find something new to explore on your next visit to Giles.